This homemade pici pasta is served with a sauce of crimini mushrooms, San Marzano tomatoes, bacon, and some inexpensive sparkling wine left over from the hoildays. While in Piedmont last year, some people on our bike tour talked up an addictive hand-rolled pasta they ate in Tuscany. What the rustic, hand-cut tajarin was to the area we were in, they said, pici was to the region around Montalcino. I had forgotten this conversation until recently when I saw a recipe for pici posted over at Jamie Oliver’s website. With a freak winter chill that descended on Houston this week, keeping us mostly indoors and so not going to the grocery store, I decided to make a hearty, fortifying pasta with what I had around the house and recalled the Oliver recipe. Pastas, like soups, have really become versatile saviors for me when ingredients are slim. Unlike the egg-rich tajarin, pici is mostly flour and water. Still, its thicker shape gives is it a nice substantial texture, and the channel that forms along the length of the rolled pasta makes a great mechanism for gathering in sauce. I can see why pici is a good pasta for ragù. As a rough guide, I used the recipe from Oliver’s site for making the pasta, a mix of 00 flour and semolina, with water and the addition of an egg, which I read is a common regional variation. The dough is a bit difficult at first when trying to get it to hold together for kneading, feeling like wet sand, and the actual cutting and rolling are time-consuming, but the results are worth it. I didn’t have much to add to the pasta, yet an inexpensive bottle of sparkling wine (left over from the holidays) and a pound of crimini mushrooms were solid lead actors. Bacon, San Marzano tomatoes, and some fresh herbs made a fine supporting cast. I have begun to think of bacon and canned San Marzano tomatoes as essentials in the kitchen, always good to have on hand like a carton of chicken stock. 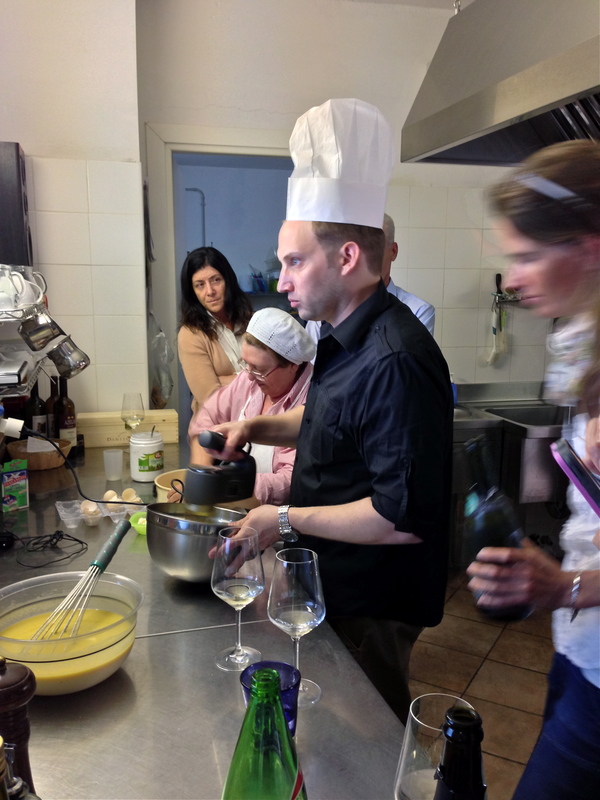 For the pici: To make the pici pasta, combine the flour, semolina, and salt in a large mixing bowl. Make a well in the middle and add the egg and olive oil. Mix continuously while adding the cold water. Oliver’s recipe called for 150 ml, but I found I needed 200 ml of water in order to achieve a firm dough I could knead. Knead the dough for about 10 minutes on a lightly floured surface until the dough is smooth and elastic. Cover with plastic wrap and set in the fridge to rest for 30 minutes. Once rested, cut the dough into 5 or 6 equal pieces and cover the ones you are not working with in plastic wrap to keep from drying out. Roll a single piece into a rectangle between 1/4-1/8 cm thick. The rustic nature of this pasta means you don’t need to be worried about being so precise with the shape. 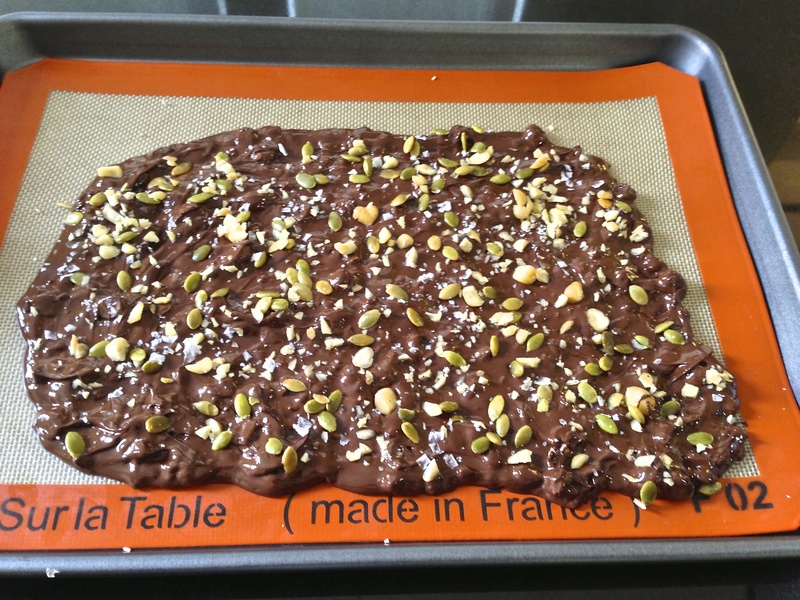 Using a sharp knife, cut the dough into about 1/2 cm strips. Then, starting at the middle, gently roll each strip into a long tube. I found it easier to roll if I lightly pinched along the length of the strip of dough first. I also covered the unrolled strips with a sheet of plastic wrap gently draped over them to keep them from drying out too quickly. When rolled, place the uncooked pici on a semolina-dusted tray or parchment-lined sheet pan. Repeat with the remaining pieces of dough. For the sauce: The sauce can be started after you’ve rolled out all of the pasta, or you can make the sauce up to the addition of the cheese and pasta water, keeping it warm and covered on the stove or refrigerated, then reheating when ready for use. In a dutch oven or large sauté pan or braising pan, cook the bacon. When cooked, remove, chop, and set aside the bacon. Add the sliced mushrooms to pan with the rendered bacon fat, and sauté until tender, about 8 minutes. Add the shallots, and cook until the shallots are softened. Add the red pepper flakes and garlic, stirring until the garlic becomes fragrant. Add the sparkling wine and reduce, scrapping up the brown bits at the bottom of the pan, until the liquid is about a scant 1/2 cup. Add the tomatoes in their sauce, crushing them and breaking them up in the pan with the back of a wooden spoon. Add the herbs. Cook until the flavors have combined and some of the liquid reduced, about 10-15 minutes. At this point, you can start cooking the pasta in boiling, salted water. While the pasta is cooking, stir in the cheese to the sauce. When the pasta starts to float, cook for another 3-4 minutes, then strain, reserving the pasta water you need for the sauce. Add the water to the sauce, reduce, and check the seasoning, adding kosher salt and cracked pepper as needed. Add the pasta, stirring until the pici is well coated and more of the liquid has reduced. 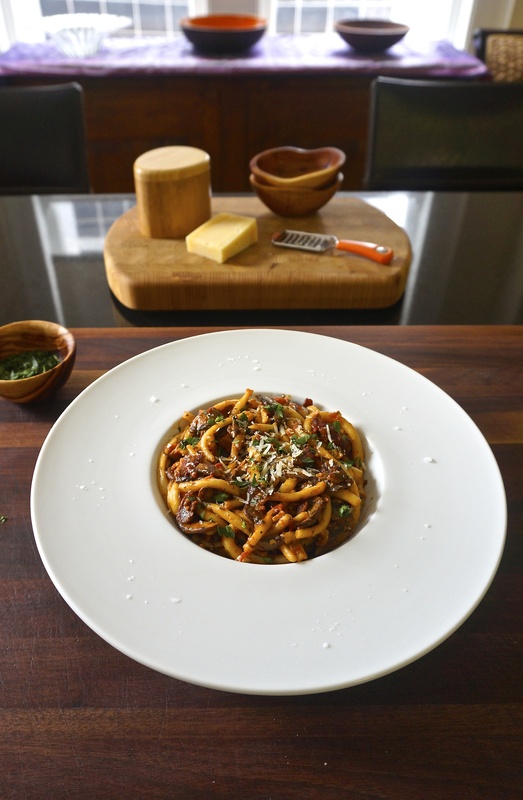 Serve the pasta with chopped parsley, fresh grated Parmesan, and flake sea salt. This makes six dinner servings. 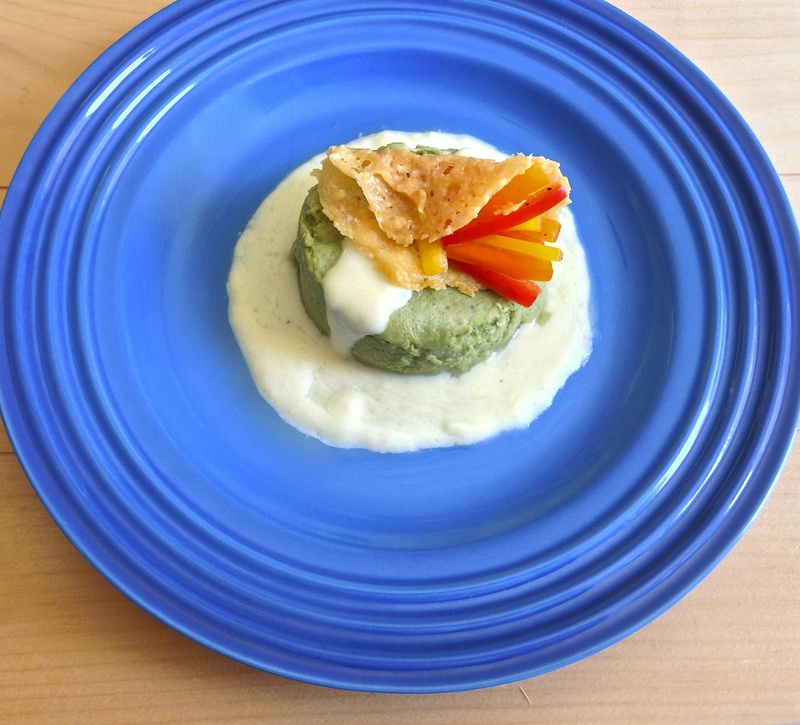 Savory asparagus flan with a creamy Fontina sauce, Parmesan tuile, and julienned bell peppers. This dish, adapted from a recipe on Epicurious, tries to recapture a little piece of Piedmont. 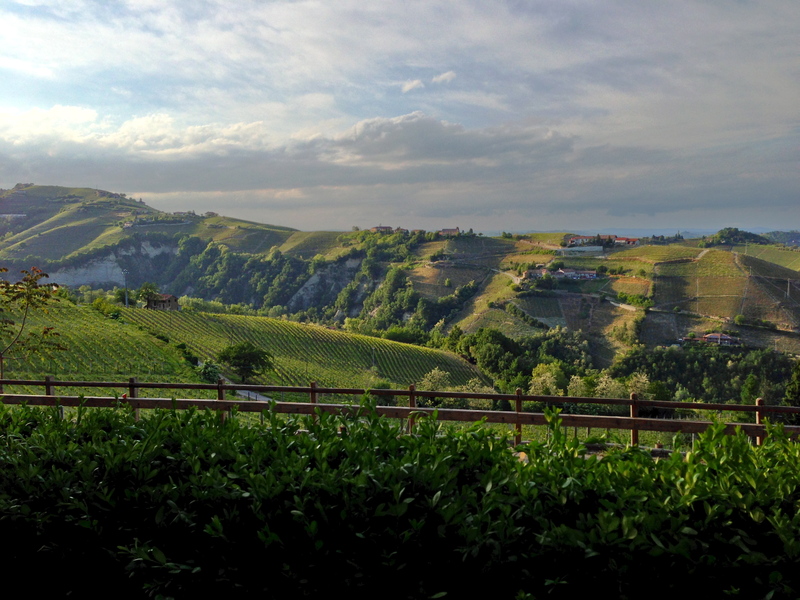 Biking from Acqui Terme to Monforte d’Alba across the Monferrato and Langhe hills, I experienced subtle shifts in the landscape, the transforming hunks and shades of the vineyards and valleys, which reflected the variations in the Piedmontese wines and cuisine. For instance, how stretching west from Acqui, the soil great for Muscato and Barbera gives way to Barbera and Nebbiolo. How the higher in elevation the hills raised, the more hazelnut groves are passed. I mentioned in my previous post that each place we stopped at had their own salumi and cheese to go with their wines, but there were some constants, each given local and personal flair. 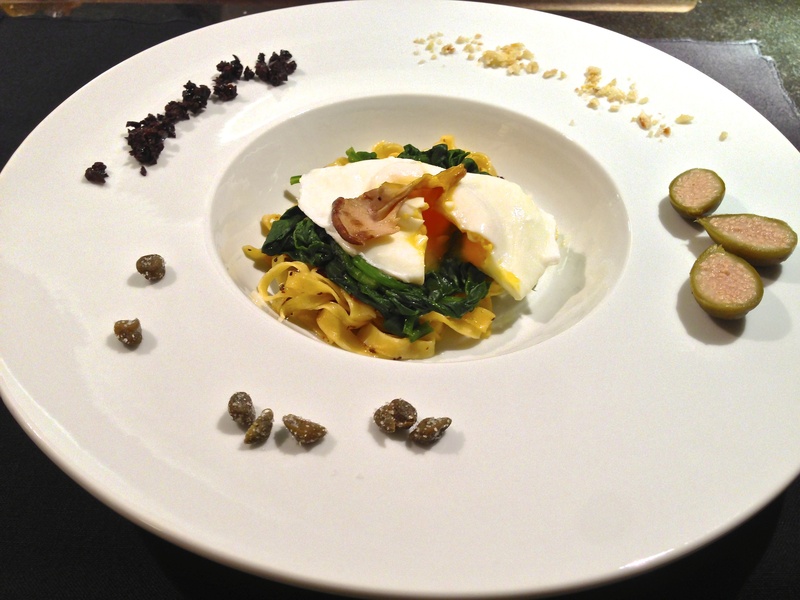 Beyond tajarin, Piedmont is known for its gnocchi, risotto, and agnolotti (or a folded ravioli). 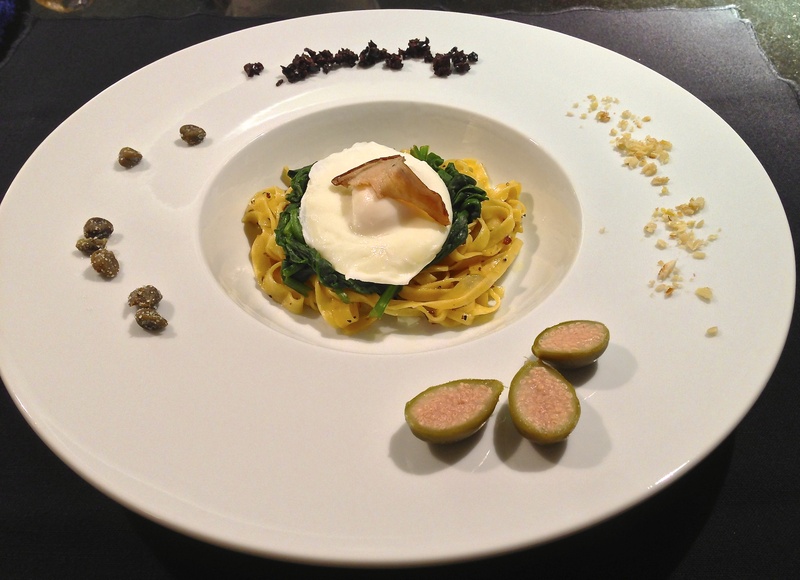 As with the tajarin, most preparations of these other pastas were simple but full of flavor. A big takeaway from all of the rustic Piedmontese cuisine I ate was that you shouldn’t mistake complexity with complicated. The dishes were complex in flavor without being unnecessarily complicated. The most involved primo piatto I had was a tajarin with a Bolognese. 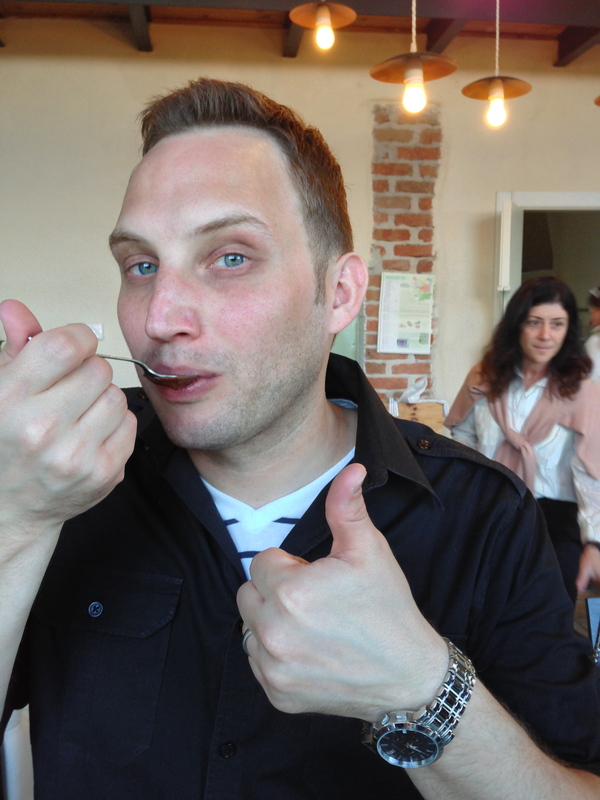 One of the best dishes I ate was in Turin at a restaurant called Agnolotti & Friends. I tried agnolotti stuffed with potato, mint, and ricotta that melted on the tongue. Seriously. 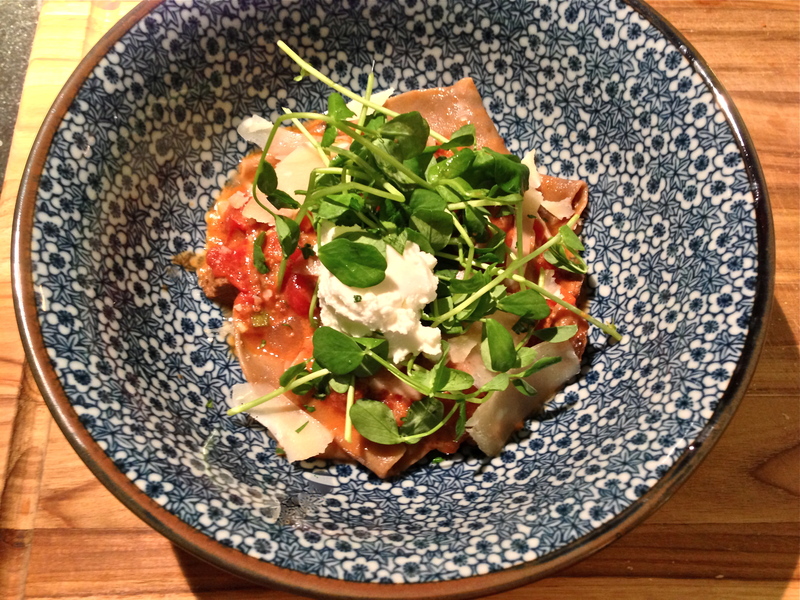 The pasta had almost the same silky texture as the beef Carpaccio I had for an antipasto. The agnolotti was simply prepared with capers, lemon, butter, and Parmesan, and was ridiculously good. I had to try to recreate it when I got home, and so I did. 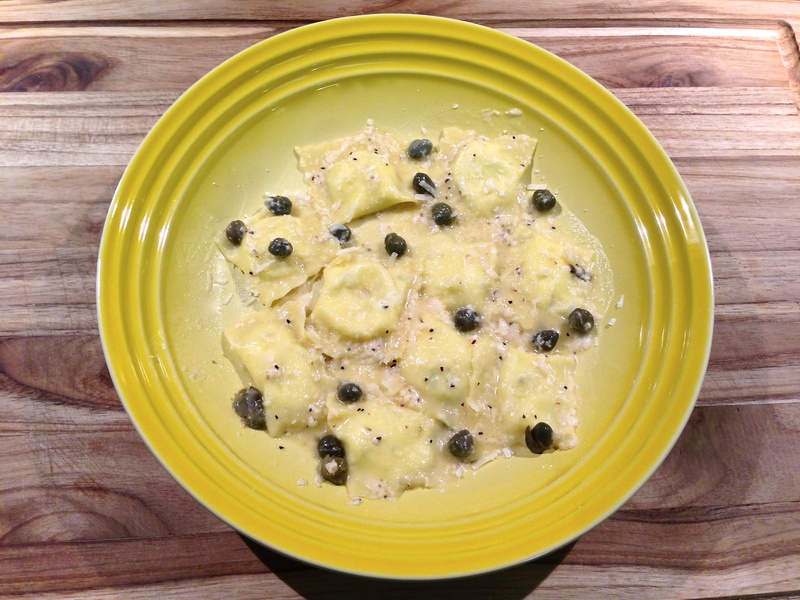 Potato, mint, and ricotta agnolotti with capers, lemon, butter, and Parmesan. For the agnolotti, I made pasta dough Piedmontese-style with 4 egg yolks to 3/4 cup of “double zero” flour and a tsp each of kosher salt, water, and olive oil. The filling is three large Yukon Gold potatoes peeled and boiled and mashed, 3/4 cup ricotta, 1.5 tbsp chopped mint, 1 tbsp butter, and enough whole milk to smooth it out. It is seasoned with kosher salt and white pepper. The texture of this dough for the agnolotti is delicate and wonderful. For the sauce for one serving, melt 1 tbsp of butter in a pan, add the capers, a tbsp of grated Parmesan or more, a little of the pasta cooking water, a quarter of a lemon squeezed, and kosher salt and cracked black pepper to taste. Toss with the cooked agnolotti, which should be done after 2-3 minutes in salted boiling water. In addition to the braised meats and salumi, we were served generous amounts of beef Carpaccio and dishes of thinly sliced or pounded cutlets of pork or veal that came topped with a mustard sauce, sometimes loaded with tuna brought over the hills from Genoa. Those dishes looked something like this link here to Gianni and Mina’s restaurant. Those meat and mustard-sauce dishes came as an antipasto. Another antipasto constant was a savory flan with a cheese sauce. We usually had either spinach or asparagus flan with a creamy and rich Fontina sauce. These savory flans were such a novelty I wanted to see if I could recreate one. 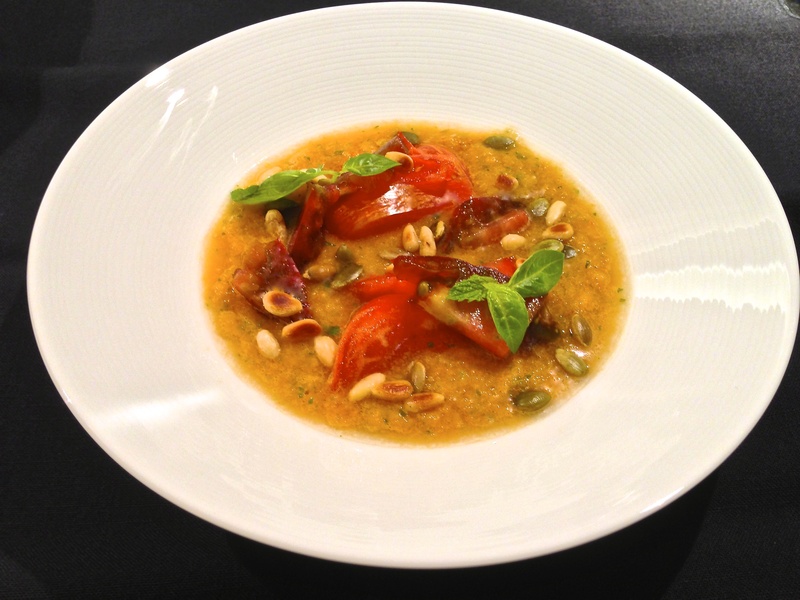 I found a recipe at Epicurious that is adapted from a dish served at a hotel in Turin. It turned out great. 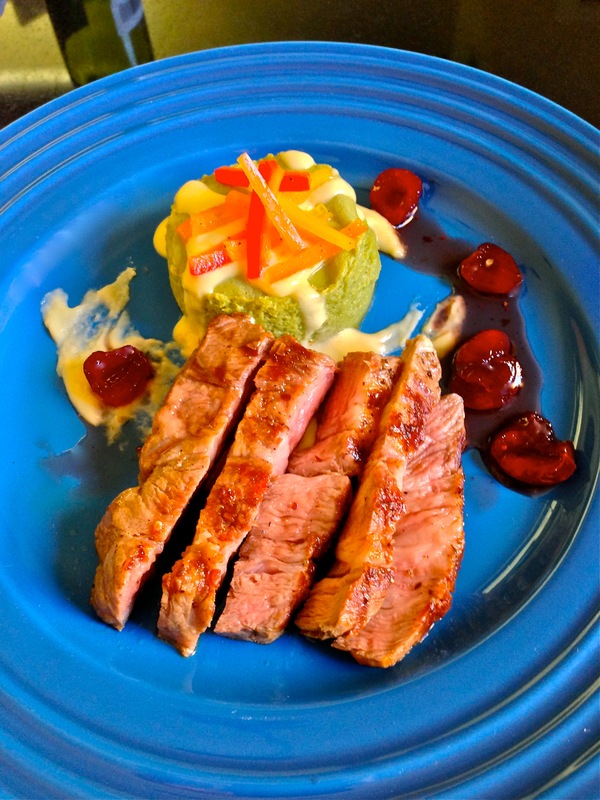 Since even halving the recipe made more flan than we could consume in one go, I used it as a side for a grilled pork collar with a cherry gastrique. The flan made a nice side for a grilled pork collar. 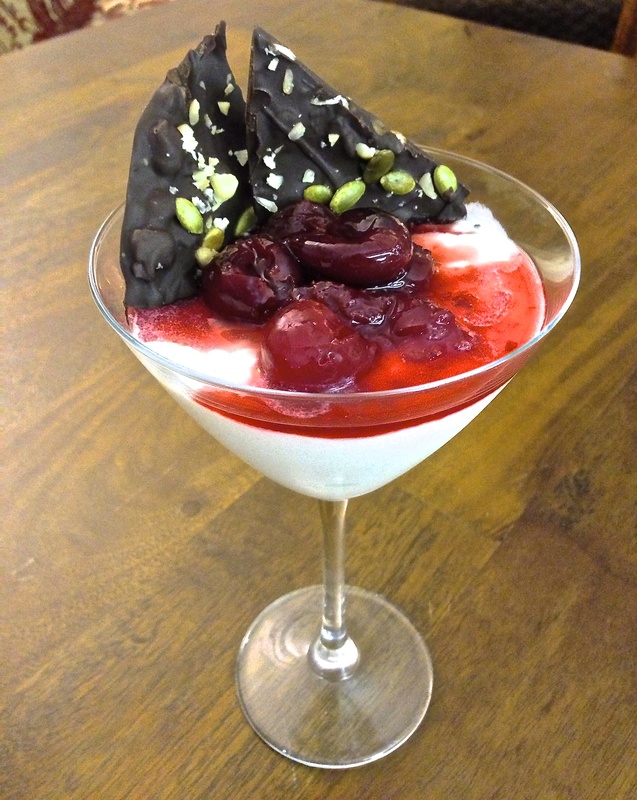 The cherry gastrique is a 1:1 mixture of granulated sugar and vinegar (half cider and half sherry). 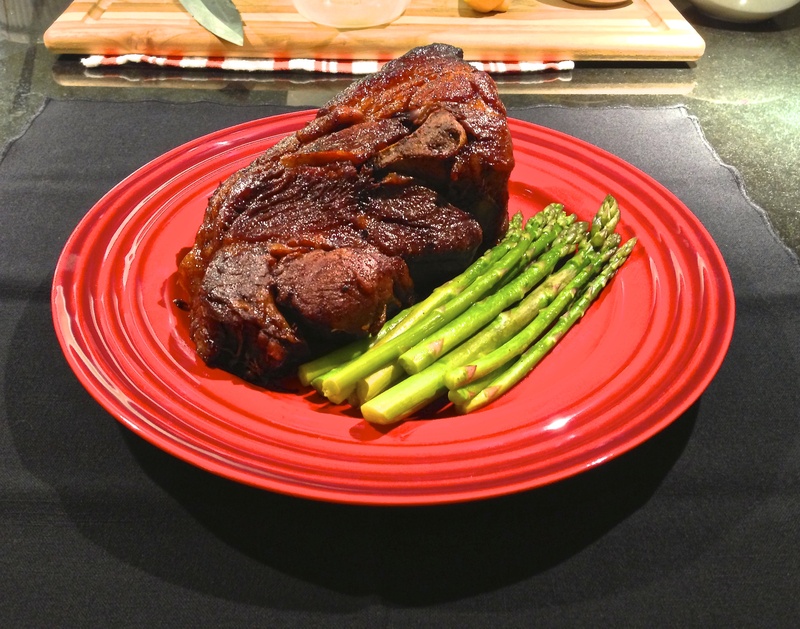 It is seasoned with fresh pitted cherries, red pepper flakes, and pink peppercorns. A typical roadside attraction. 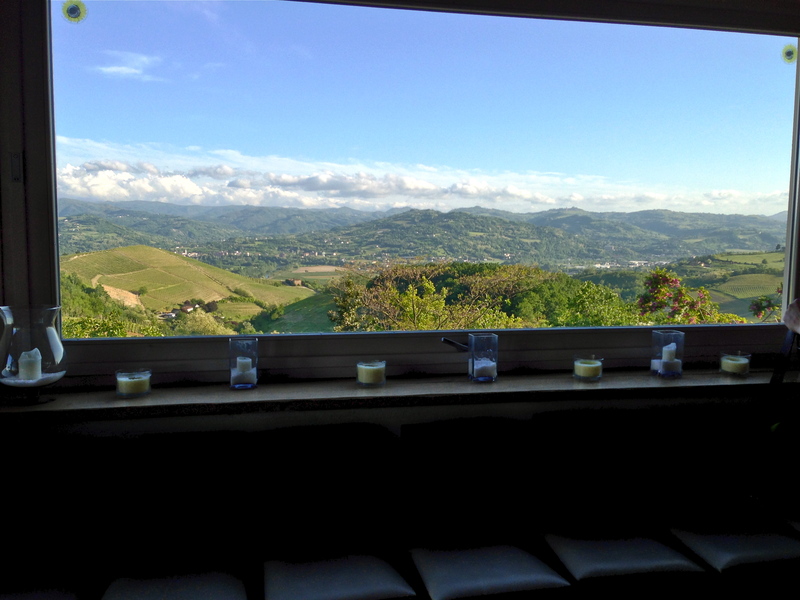 Here, it’s a view in Santo Stefano Belbo. It never hurts to finish with Barolo. 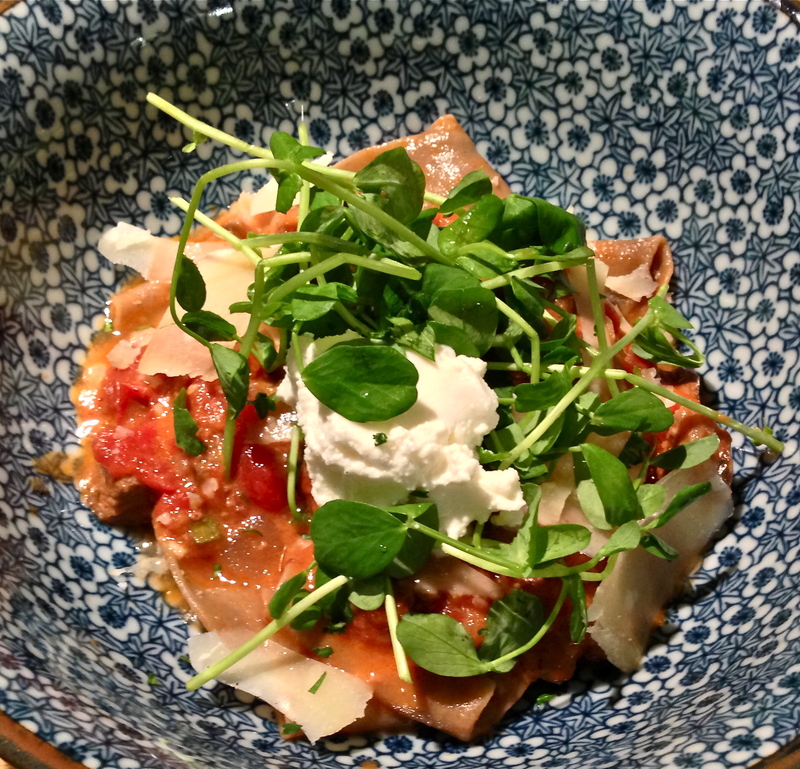 Black Garlic Pappardelle with Lamb Ragù alla Bolognese, garnished with pea shoots, shaved Parmesan, and ricotta. 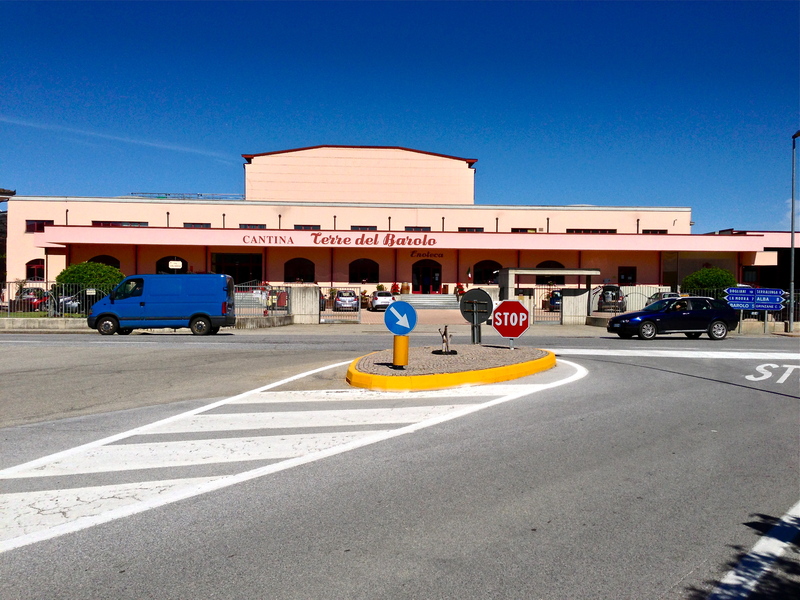 Yesterday, Slow Food USA shared a link on its Twitter feed to an article about Slow Food Italy’s creative response to the recent scandal of horsemeat-tainted prepared foods across Europe. Their idea: stuff your own pastas and make your own meat-based sauces in protest. Or in other words, know where your ingredients are coming from and what they are. In my own—not exactly selfless—gesture of solidarity, I made Pappardelle Ragù alla Bolognese. My dish was not traditional. First of all, I used lamb. I also added a mix of herbs with my dry bay leaf: thyme, rosemary, oregano, and parsley. I filled out the conventional Bolognese soffritto (onion, carrot, celery) with diced calabacita italiana, or Italian zucchini. 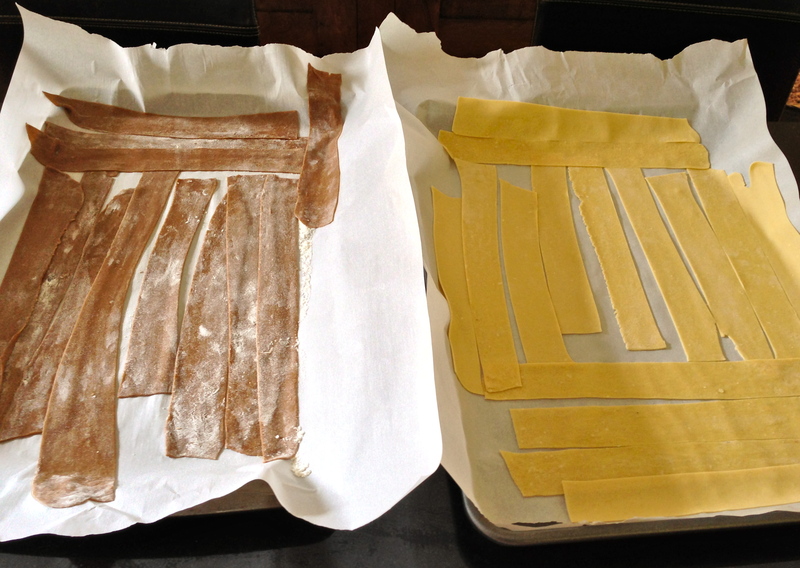 The pappardelle is also a variation: I made it with black garlic. I love the Slow Food attitude that politics can perhaps be palatable. 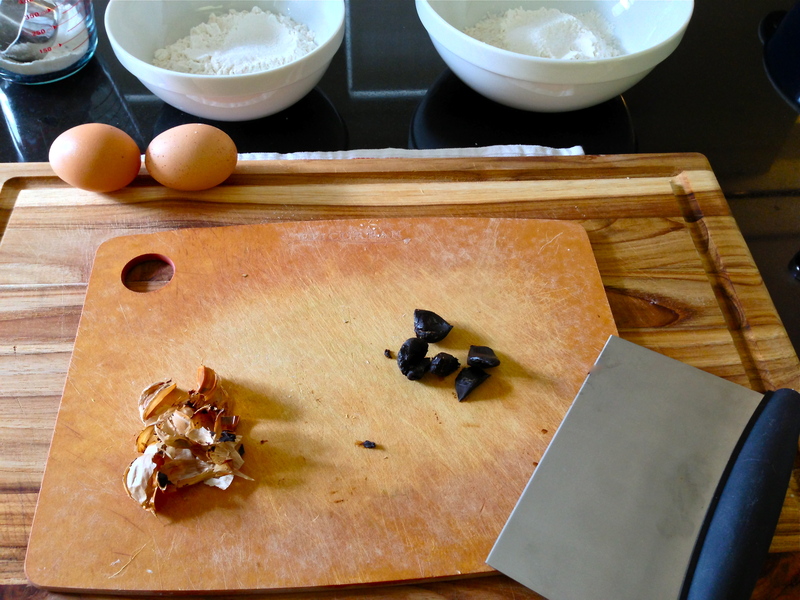 Like one would do with spinach, I mashed the black garlic into the flour and egg as I was making my dough. I used five cloves, 1 egg, 3/4 cup flour, plus a bit extra, 1 tsp kosher salt, and 1 tsp olive oil. In case the black garlic experiment didn’t work, I made a plain batch. For the ragù, I browned 4 lamb loin chops and braised them with sautéed diced red onion, carrot, celery, calabacita italiana, and pancetta. The braising liquid is 1 cup red wine (reduced), 1 cup chicken stock, and 1 can San Marzano tomatoes, chopped. I tied a few sprigs of rosemary, thyme, parsley, and oregano together and added them with a bay leaf. I braised the meat for 2 hours at 300 °F. The meat is removed from the bone and chopped when finished, then added back to the sauce after the fat has been skimmed.